Last Friday I travelled to the local archeological theme park 'Archeon', as they had some Roman legionnaires over for two weeks. This offered a great opportunity for some photography, and possibly some conversations on life 2000 years ago. Archeon is a nice small theme park in Alphen a/d Rijn. I used to work there as a volunteer back in 1996, and continued going there, as its beautiful historical buildings from Dutch prehistory, Roman times and Medieval times form a great decor for testing out cameras and lenses. The Roman section refers to a period ranging from 53BC, The end of Julius Caesar’s Gallic campaigns and the fixation of the northern Roman border along the Rhine river, to roughly 270AD. The Romans developed small border towns and forts along this northern border , as seen on the Tabula Peutingeriana, a 13th century replica of a map of the Roman road network in the 3rd century BC. This road map lists 13 different Roman settlements in the Netherlands. One of them is Albaniana, a small border fort . Archeological digs have turned up evidence Albaniana was located where the city of Alphen a/d Rijn now lies. 270AD is the time when continued Frankish aggression prompted the Roman military to withdraw their cohorts from the most northern borders. Their forts were possibly inhabited by auxiliary troops, until they were overrun by the Franks, as happened in other places along the border. The small Roman town created in Archeon contains mostly civilian buildings dating from this time. The chances are slim that they actually existed at the time of Castellum Albaniana, as a small border lookout post probably didn’t warrant the construction of temples and bathhouses. Regardless, it gives a nice feel of how it is to walk around a Roman town, and it provides a great backdrop for Roman re-enactments. Legio Secunda Augusta is a British Roman Re-enactment group. They have people recreating how it is to live in Roman times, with military personnel from the era, as well as civilians showing the various crafts and arts they used to employ. 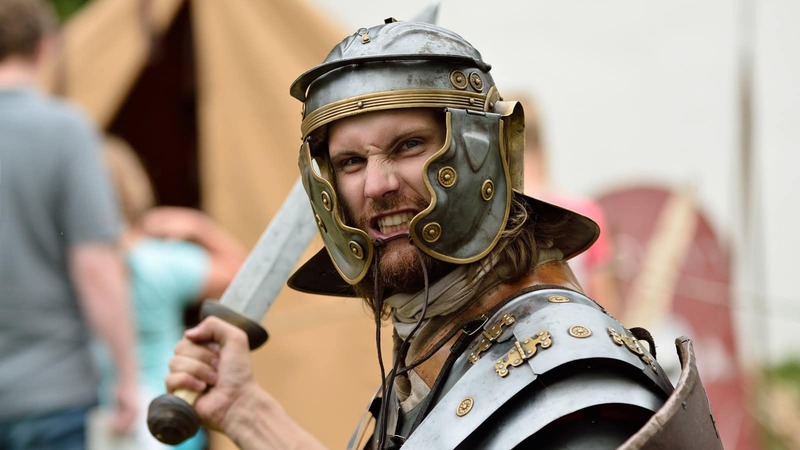 Every year, the Legio comes to Archeon to liven up the park in a Roman festival. After Octavian came to power in 27BC the senate granted Octavian unprecedented civil and military powers, and bestowed on him the title Augustus. Following this, one of his first thoughts was to the composition of his army, which had been in disarray since the Civil Wars. He substantially reformed the legions, by disbanding those whose previous loyalties had brought them under suspect, creating colonies for the veteran soldiers and forming new legions loyal to himself. The three imperial legions II, III and VIII, which are all entitled Augusta or ‘Augustan’, specifically identify them as formations during his principate . The legion participated in the Roman conquest of Britain in 43AD. Future emperor Vespasian was the legion’s commander at the time. The Legion proved to be one of the best, even after its disgrace during the uprising of queen Boudica. After the defeat of Boudica, the legion was dispersed over several bases in Britain, most of them in Wales. In 402BC the continued pressure on the Roman heartland by the Gothic tribes prompted the emperor to withdraw a lot of troops from Britain and other outlying areas of the empire. This led to the northern tribes crossing the Rhine in the Netherlands and Germany in 406AD, killing and pillaging along the way. Fears of being cut off of the empire led the armies in Britain to leave, returning to the mainland. The Roman empire fell in 410 with the sack of Rome. The members of Legion Secunda Augusta had brought lots of equipment and clothing, and were happy to demonstrate how everything worked. This leads to interesting insights , and great pictures of details and uniforms. The day ended with a demonstration of military tactics, and how to use artillery. I shot everything with the 70-200 lens. The amount of detail, and the great freedom of movement made this the perfect lens for this situation.